Despite the old saying—a lawyer who represents himself has a fool for a client—Edith Foulkes is a smart woman, at least in the courtroom. 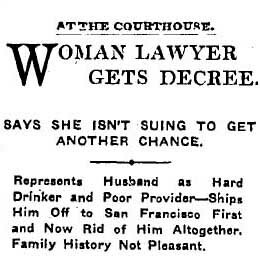 She can’t make the same claim about her trip to the altar, however, which is what brings before Judge Bordwell. Although she had known her husband, Ralph, for eight years, they were only engaged for a week before they got married in 1905. His family was coming to visit and he wanted to be married when they arrived, he said. A member of the California bar who had practiced law in San Francisco and Tulare County, Edith had previously worked as a proofreader in Los Angeles and presumably that’s how she met Ralph, who had been the foreman of a printing shop on Los Angeles Street. Edith had spent a fair amount of time in Mexico and Porterville, Calif., so most of what she knew about Ralph was by correspondence. If she had spent more time with him, she might have known that he had a tendency to steal and pawn whatever he got his hands on. And he drank all the time. In fact, once he lost his job, Ralph drank constantly, Edith and a pressman from the print shop told the judge. The rest of the time, he was in a bad mood, they said. “Suspecting that his wife was beginning to consider her marriage a failure, he had talked in melancholy fashion of murder and suicide, somewhat to the martial discomfort of Mrs. Foulkes,” The Times said. This entry was posted in 1907, Black Dahlia, Books and Authors, Fashions, Homicide, LAPD, Streetcars. Bookmark the permalink.